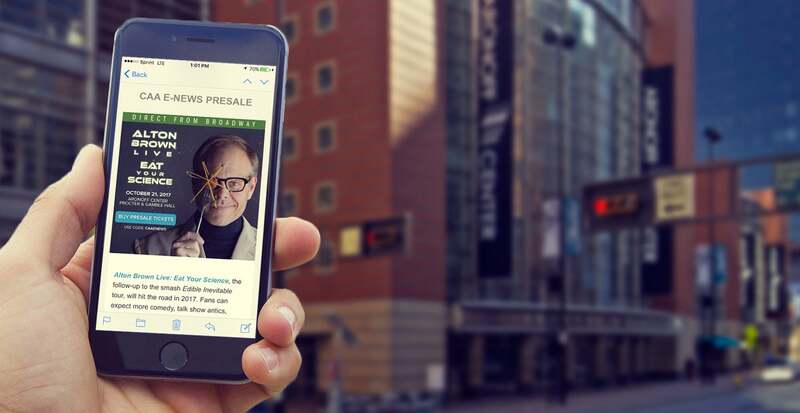 The Cincinnati Arts Association’s E-NEWS subscription is a quick and easy way to stay informed about what is happening at the Aronoff Center and Music Hall AND to receive priority offers to the best shows! Up-to-date news and information about events at the Aronoff Center and Music Hall with our newsletter. Why do you need my personal profile information? We will use your profile information and preferences to send you e-mails that best fit your specific interests. E-mails include information about upcoming events and happenings at the Aronoff Center and Music Hall, as well as special announcements and promotions. Can I update my personal profile at anytime? Yes. You can update your personal profile at any time by clicking on the link at the bottom of every email that you receive from us. How can I unsubscribe from E-NEWS? Will you share my e-mail address with anyone? No. Your privacy is extremely important to us; therefore, we will not sell, rent, or give your name, e-mail address, or personal profile information to anyone. You can use the link at the bottom of every email to unsubscribe, or change your personal profile to receive less or more information, at any time. For even better benefits and increased priority for ticket purchases, consider a Cincinnati Arts Association Membership. CLICK HERE for details! We enjoy hearing from our E-NEWS subscribers and welcome your feedback! If you have any suggestions or comments, please send them to [email protected]. Thank you for your interest in the Cincinnati Arts Association, the Aronoff Center, and Music Hall. We hope that you enjoy your benefits as a CAA E-NEWS subscriber!